Attention club members that attended the East Broadtop Rail Road (EBTRR) shoot on March 8th 2014. We are going to create a slide show of images from the EBTRR shoot to be shown at the May 4th club banquet. Please provide up to 10 of your images with your © copyright on them. Get them to Bill Baird no later than March 16th. Put them on a thumb drive or CD and bring them to a meeting or send them via Dropbox. Thanks you! With the start of 2015, the club is moving to a new location. We will be holding our meetings at the new Hollidaysburg Area Public Library. It is a fantastic new building with amenities that will benefit us greatly. The community room is has a wonderful audio/video setup that we're sure to love. Meetings days and times will remain the same. Meetings take place on the 1st and 3rd Mondays of each month at 7:15pm. (With some exceptions for holidays). This is a planning meeting. We will elect next year's officers. And most importantly we will be discussing the possibility of the club moving the meeting place to the new Hollidaysburg Library. This will require changing the meeting dates also. So please attend this meeting because we need your input. It is vital to a healthy club. Are in the "Photo Gallery" for your viewing pleasure. 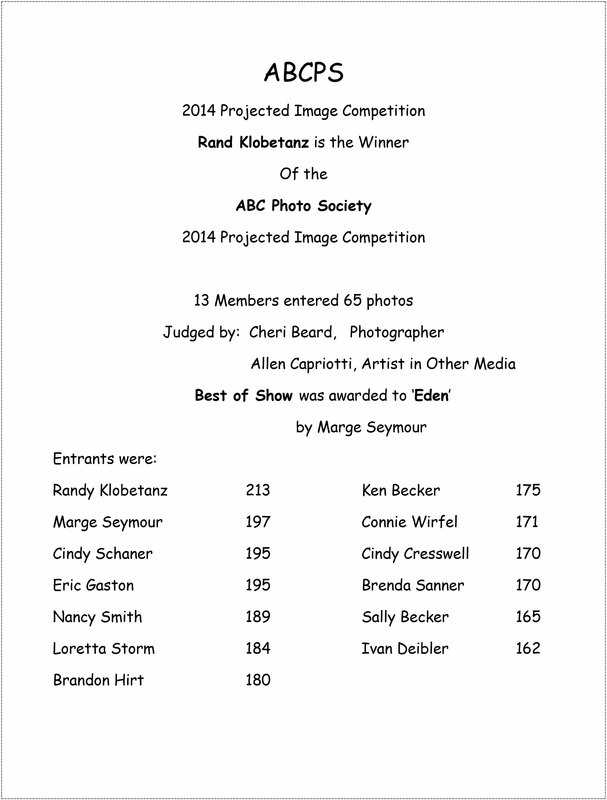 Results of the Projected Image competition will be shown. We will not be meeting at the YMCA this coming Monday. We'll be meeting at The Film Center in Altoona at 7pm. Britt will be showing us "what's new" in the world of photography equipment. Lakes, Streams, Waterfalls, Reflections, etc. This is a meeting you should not miss. Members will tell us a little or a lot about their favorite photographer. Whether it's an old-school master or a current pro, show us some work that we can use for inspiration. It doesn't have to be anything fancy. Take 5 or 10 minutes for a presentation. I will bring a Wi-Fi hotspot so we will have access to the internet. It is Members Choice night. Show us what you have been shooting. Gather 25 or 26 images together as a slide show (alphabet soup?) or individual files and get them to Bill Baird. You can send them to Bill using Dropbox. It is free and safe. Or bring them to the meeting early on a thumb drive or CD. Street/People photography by Dave Hammaker & Eric Gaston. We are back at the YMCA beginning with this meeting. Our Photowalk will be at The Allegheny Portage Railroad National Historic Site (Lemon House). There will be some antique Automobiles for us to shoot in the parking lot, weather permitting. The cars will arrive around 6:30 PM so we should arrive before that time. If it rains, they will not bring the cars out and this event will be canceled (and maybe rescheduled). 12 miles west of Altoona and 10 miles east of Ebensburg. Take the Gallitzin Exit and turn right, following the signs. . This Monday, we will have a “bring your own food and drinks” picnic and Photowalk at Canoe Creek State Park. We will eat at 6pm then go for a Photowalk. Meet at Pavilion #2. Fort Roberdeau 5PM – 8PM. Be sure to give John a “Thank You”. From 17th Street in Altoona, go north on Valley View Blvd for 1.6 miles. Turn right onto Kettle Road. Follow Kettle Road for 8.4 miles. At the big, brown “Fort Roberdeau” sign, turn left onto Fort Roberdeau Road and follow it for four-tenths of a mile; at the fork, bear right for three-tenths of a mile. You’ll see the reconstructed fort on the right; parking is on your left, in the field.